first of all it needs some water and second it needs some time. Otherwise, no idea if the day form is, I find it today very uninspired. Very sweet sherry notes, liquorice, some oak. The whole thing smells like PX sherry, with a hint of mint. only slightly tingling, then sweet sherry flavors, combined with some spicy oak. 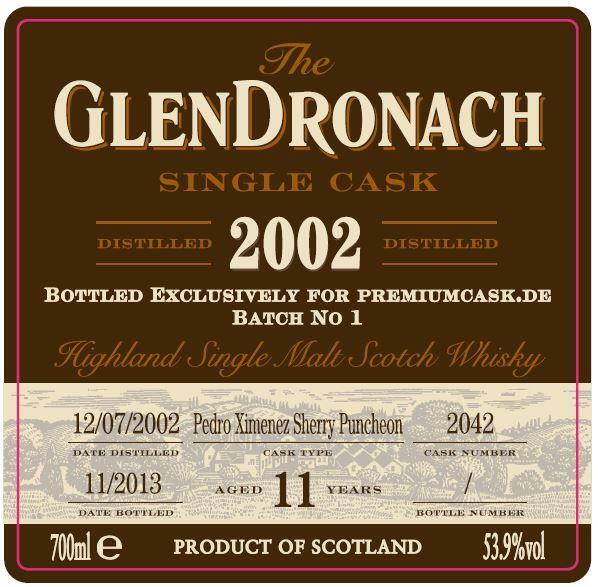 slightly astringent, tart oak and sweet dried fruits. Sounds like sherry and oak, slightly mineral aftertaste. Departure pretty short. The first nose is very sweet, but at first I always find a slightly disturbing, "artificially" smelling undertone, which somewhat affects the overall impression. After adding a few drops of water, this stitch has abruptly disappeared, and the great caramel (Werther's Real) unfolds wonderfully. The unbridled sweetness continues in the mouth - a nice, pleasant tingling heat rises after each sip. Nothing burns, great integration of the alcohol (also undiluted). Long finish, some dryness in the throat - great! Nice complexity, would have estimated him a little older than his eleven years. Quite enjoyable. 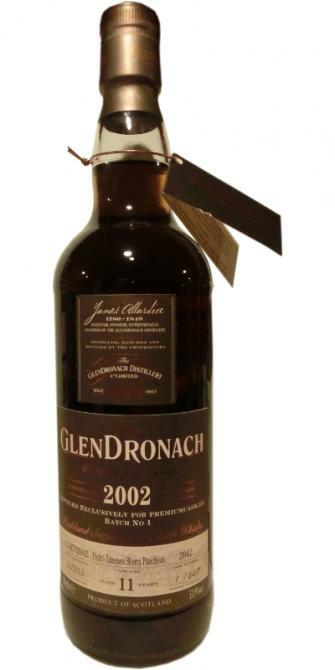 This Glendronach is not very chatty. More fruits and sherry by adding some water. Sherry, marzipan, caramel, dark fruits, gun powder, coffee, wood polish, nuts. Sherry, marzipan, dark fruits, dried fruits, prunes, a touch of bitterness. Medium. Dark rum chocolate, wood and some spices. A good, tasty sherry whisky that has not only dominating sherry flavors. Orange, caramel, red fruit, coffee. Full, sugar, caramel, red fruit, light pepper. Long, sweet, caramel, slightly bitter.